Yvonne Jacquette is an American painter and printmaker known for her aerial landscapes and pointillist technique. Since the 1970s she has devoted her career solely to documenting bird’s eye views of cities, including Chicago, New Orleans, San Francisco, Hong Kong, and most importantly New York City, her home for nearly 60 years. In 1964, Jacquette married fellow artist and acclaimed photographer Rudy Burckhardt (1914-1999). Together they took on New York, and while her husband was on the ground photographing pedestrians and outdoor advertising, Jacquette was above it all creating her signature pastels and electrifying nighttime views of architecture. 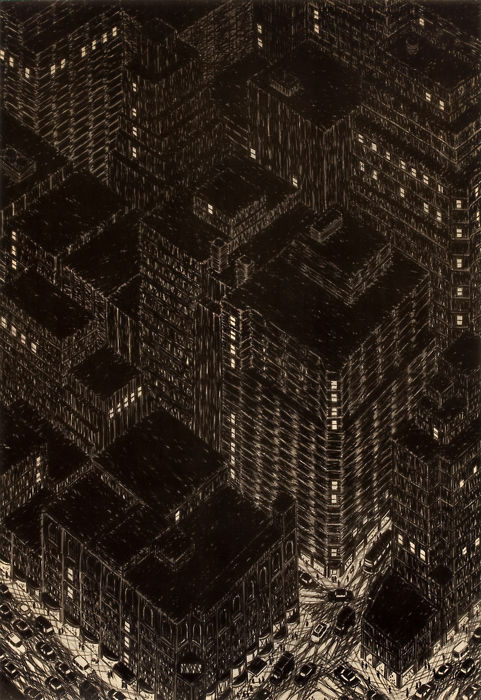 Though Jacquette eliminates the human element of the city from her pieces, she nonetheless manages to capture its spirit with her tightly clustered, uniform brushstrokes, her experimental combinations of perspectives, and her ability to translate its restless, gridlocked streets into works of simple patterns of light and shadow. Yvonne Jacquette’s paintings and works on paper can be seen in the collections of the Metropolitan Museum of Art, the Brooklyn Museum, the Smithsonian American Art Museum, and the Philadelphia Museum of Art. Page last updated by Rutgers–Camden Center for the Arts at 1:44 pm January 23, 2014 . This page was printed from http://rcca.camden.rutgers.edu/collection/yvonne-jacquette/ at 6:32 AM Friday, April 26, 2019.